Former Chancellor of the Exchequer and editor of the London Evening Standard, George Osborne, recently joined local business leaders at a fundraiser for The Welcome, a support centre on Knutsford’s Longridge estate. 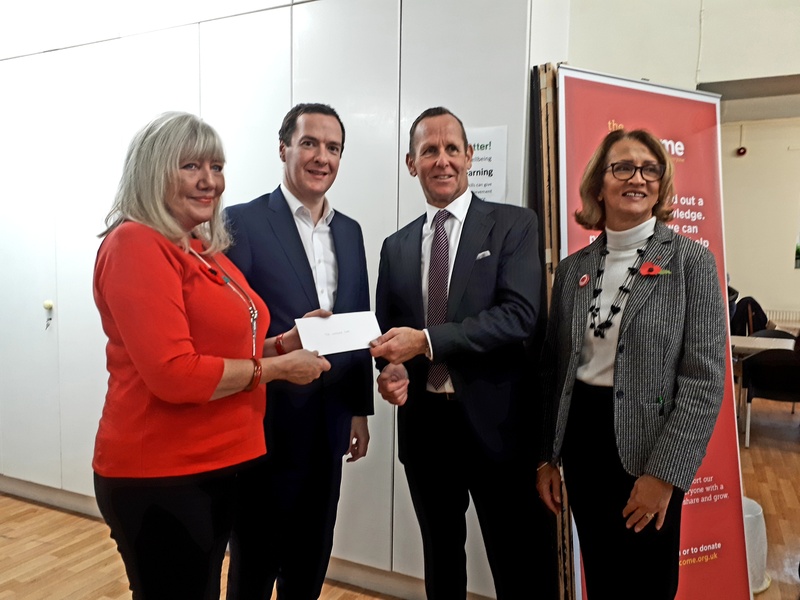 Osborne is a patron of the charity and recently made a £10,000 donation to support its work on combating social isolation. Ultimate are also proud supporters of the centre and regularly assist with its marketing and fundraising efforts. The Welcome offers local residents a place to come and join in a wide range of activities and enjoy an affordable hot meal. It is used by young children, teenagers, parents and retirees, with something for everyone to get involved in. In 2011, the charity was awarded the Prime Minister’s Big Society Award in recognition of the difference it has made to the local community. In order to continue their work and offer a greater variety of activities, The Welcome needs to raise an additional £5,000 a month or £60,000 across the year. Earlier in the year, Ultimate helped The Welcome with its branding to help boost its profile and help demonstrate the amazing work they do. Bold and colourful graphics now feature on the windows and walls, and the cafe menus have been given a complete overhaul. We have also given them a range of eye-catching icons which show off all that they can offer. Osborne’s visit is his first to the area following his departure as the MP for Tatton in May 2017. However, in a speech to fellow supporters and business leaders, Osborne stressed that he is keen to stay involved with the charity for years to come. He praised the work of the centre’s staff and volunteers and echoed the Lord-Lieutenant's comments on The Welcome’s dramatic change in fortunes. Just 18 months ago, the charity was in financial difficulties and on the verge of closing. However, a rallying of support in the local community has not only allowed it to survive but also expand, with a youth group recently opening. Marie Fox, Operations Manager at The Welcome, also shared inspiring stories about individuals whose lives have been transformed by the charity’s work. She spoke about a local resident called Molly, who was struggling with social isolation and panic attacks. Staff at The Welcome provide Molly with the necessary support and encouragement to build her confidence and help her to meet new people. She began working as a volunteer in the cafe and recently passed her Level 2 Food Hygiene certificate, the first exam she’d ever sat. Sarah Pownell, the centre’s support worker, also described how the charity supported her in the difficult years following the birth of her son as she battled with postnatal depression. Sarah is now responsible for outreach work and volunteer co-ordination at The Welcome and is keen to share her story with others. Following these speeches, we were all treated to a delicious meal by The Welcome’s cook, Elenor McAndrew. One of the local businesses in attendance was Bentley Manchester, whose premises are adjacent to the Longridge estate. Back in April 2017, the company committed to raising £30,000 for The Welcome. At the fundraising event, the Managing Director Jon Crossley was proudly able to hand over the first cheque towards that goal. As well as discussing the achievements of The Welcome, George Osborne also answered a number of questions on the Northern Powerhouse and Brexit. He outlined how he sees the Brexit negotiations proceeding from this point, and how he believes that the UK government will secure a deal with the EU but struggle to get it passed through Parliament. In regards to the Northern Powerhouse, Osborne noted how Northern civic authorities and business leaders are now the ones driving this vision, rather than central government. He encouraged business leaders to keep up the pressure and find new ways to collaborate across the North. Osborne also pointed to recent developments in Manchester’s transport infrastructure, like the introduction of the Ordsall Chord. If you are interested in supporting The Welcome yourself, please do check out their website.